I’m playing catchup with the BeerClub beers, and I was looking forward to this a couple weeks ago before I got the bot. Throw back, throw back, throw it back, and throw one. Big fan of David Bowie I already like this brewer, their beers and labels, which includes a music match, and although I’ve yet to drink the beers what could go wrong? a true to style late ’90s IPA with a light sweet malt backbone, lots of delicate floral hops and a balanced soft bitterness that follows through well after the last sip. The 8th Annual West Coast IPA Challenge entry 2015. An OG tribute to the old skool USA IPA’s before everyone got obsessed with hops and IBU…BALANCE! Light sweet malt body with a soft bitterness which carries on giving long after the glass is empty. Generous amounts of hops but kept in balance with the malt and alcohol to create a classic easy going IPA. You may detect citrus, marijuana and earthy notes along with the balanced hop bitterness. Rich hop and sweet aroma on opening this, nice hiss too, Lovely golden orange pour with a lovely white head that starts well and settles to less but persistent whiteness. Lots of heavy citrus aroma in the glass, should I go with passionfruit? It seems more bitter than the apparent IBU lets on, quite sharp and prickly. Not over carbonated, if anything a little under bubbled. But chock full of flavour and layers that makes it really enjoyable. Has a great mouthfeel and might have that quality that you might call “chewiness” where the fullness gives you reason to swirl or switch the beer about a bit enjoying the tastes that it offers up. Bitter linger in the mouth after drinking and the bonus burp. Pretty much as it reads then, soft easy drinking nicely bitter beer, with a lingering mouthfeel, citrus and fruits abound, looks great, drinks well. Nothing to be afraid of here. The pdubyah-o-meter rates this as 8 of its things from the thing. 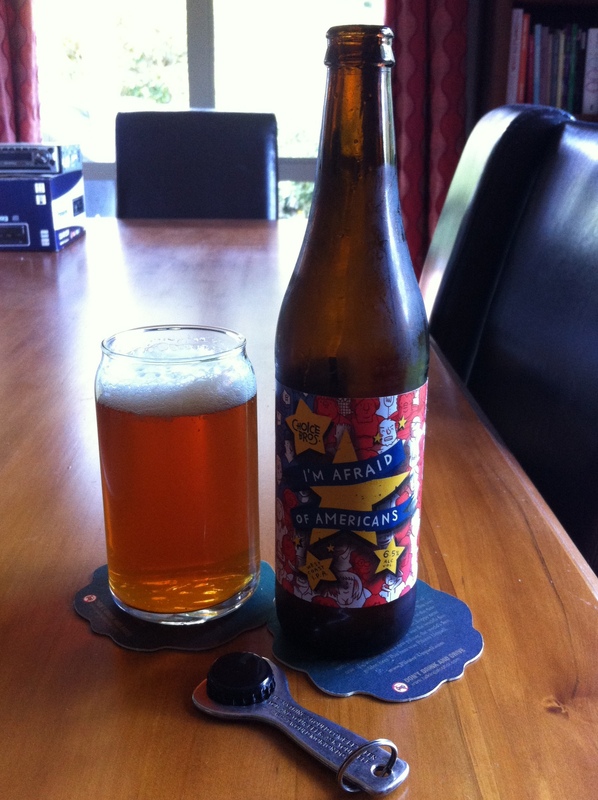 It is very good, well behaved and inoffensive IPA beer that get about its business in an orderly and quiet fashion. Very moorish. Am I enjoying it? Yes, what’s not to like about this? Would I have another? It would be no pain to have a few of these to be honest. Would I share with a friend on a porch and set the world to rights? It ticks all the boxes of taste, style, backstory and conversation piece. This would be a great way to spend a few hours listening to music and telling half-truths in the evening. 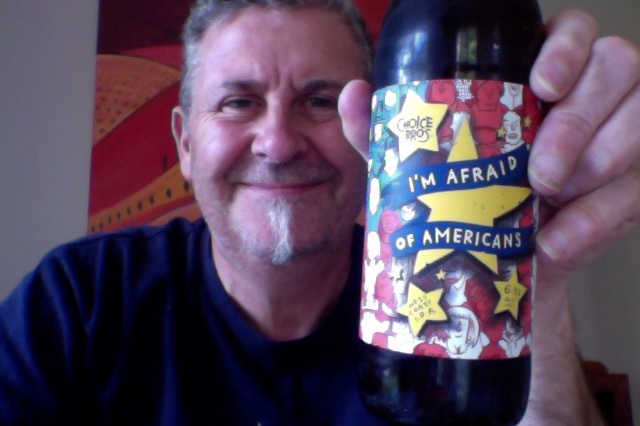 This entry was posted on October 23, 2015 by Philip Walter in Beer, Beer of New Zealand, Beer Review, Craft Beer, Critic, India Pale Ale (IPA), Justsaying and tagged Choice Bros, Choice Bros I'm Afraid of Americans, craft beer, I'm Afraid of Americans.